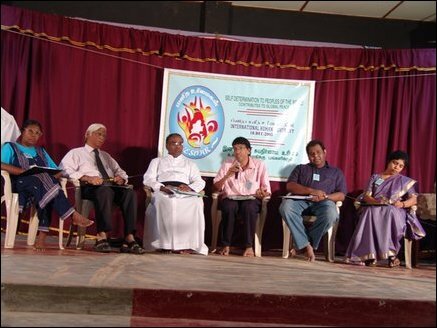 “While Colombo has been increasingly engaged in portraying Tamils’ struggle for self-determination as ‘terrorism’ in international fora taking advantage of the changed political climate following the terrorist attacks of 9/11, and the consequent war on terrorism, Liberation Tigers have exhibited genuine desire to adhere to the international human rights standards by closely engaging with UN agencies,” said Political Head of Liberation Tigers of Tamil Eelam (LTTE) , S.P. Thamilchelvan, during his keynote address on Human Rights day event organized by the NorthEast Secretariat On Human Rights (NESOHR) in Kilinochchi Saturday. "Human Rights has gained prominence in the last few years as global climate on terror has allowed Nations to advance their own national interests using Human Rights as an instrument. We are saddened by biased application and adoption of double standards in approaching Human Rights issues," Thamilchelvan said. Right to life, Right to Identity and the Right to Homeland constitute the three most essential tenets of Human Rights. Right to Homeland represents a fundamental “Collective right” of a people so that every member of this group can exercise freely his or her political, economic, civil and social “Individual Rights,” Thamilchelvan said. The right to Homeland represents an inalienable fundamental right of a people to determine their own political destiny without any external coercion and, if necessary, to seek secession, he added. “It is critical for us to understand the legacy of western European thinking related to human rights, statutes and the international covenents on Human rights, to declare the legitimacy of our struggle and to expose the transgression of the Sinhala polity on Tamils fundamental rights. Current human rights statutes are codifications evolved from peoples' “natural rights” and “inalienable rights," a body of thinking advanced by 18th century philosophers Locke and Rousseau. In this context, Self-determination relates to the collective right to life with freedom, and represents peoples’ right to live as a nation. The fundamental rights of people is also the inspiration behind and cornerstone of US’s Declaration of Independence,” said Thamilchelvan. "Many international humanitarian agencies are working in the liberated areas of the Tamil homeland independently without any harassment or hindrance. We have assured our full co-operation for anyone who wants to conduct investigations to independently verify complaints," he added. "Article 4 of the Interim Self Governing Authority (ISGA) proposal we submitted for NorthEast governance demonstrates our commitment for human rights," Thamilchelvan pointed out. "Allegations still continue on the matter of recruiting children. We continue to explain the ground realities of children who have lost their parents in the war and have been driven to poverty. We are closely interacting with UNICEF and other relevant agencies to address their concerns. "Statistics relating to allegations are provided to the UNICEF periodically and the process of dialogue is ongoing in this matter. We have open invitation to UNICEF and other human rights agencies to work with us to institute effective realistic enquiry proceedings into the allegations," Thamilchelvan noted. "We had discussions with the Secretary General of the Amnesty International (AI) last week and invited AI to conduct an independent survey. The number of joint projects we have ongoing with UN agencies, ICRC, and other international organizations for human rights indicates the level of transparency we have adopted to help allay concerns of these agencies," LTTE's Political Head said. 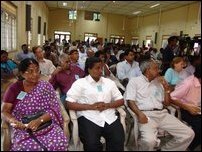 Successive governments in the South have alienated Tamil people, in sharing power within the Sri Lankan political system and unleashed genocidal viloence to Tamils' non-violent resistance against discrimination and oppression. 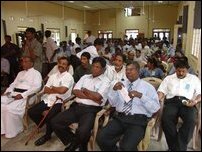 Now Tamils have evolved into a strong force asserting their distinct identity under a national leadership. 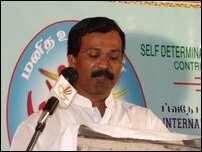 Around 18 000 youths gave their lives in the war to safeguard the inalienable right of Seif determination, Thamilchelvan said. "While commemorating the International Human Rights Day today, let us think of the hundreds of thousands of our people killed by state terrorism and hundreds who have disappeared under military occupation. Let us resolve to unite in our mission to win our rights to our homeland on the basis of self- determination. Let us resolve to cherish human rights in our homeland, and preserve and nuture our national and cultural traditions," Mr. Thamilchelvan said. "Today, Tamil people are living in their homeland deprived of their right to life and the right to live with freedom and dignity. Our homeland is under occupation by the Sinhala military and our people are driven from their homes and forced to live in refugee centres. Whenever our people demonstrate against the injustice and express their political aspirations, they are threatened of their lives by the military, despite the cease fire agreement," he said. "Sri Lanka Governments have not yet conducted proper investigations to provide answer to the parents and relatives of hundreds of Tamil youths who disappeared in Jaffna immediately after the Sri Lanka military occupied Jaffna peninsula. Sri Lanka's political and legal systems have stymied exposing security forces' complicity in Chemmani mass graves, Bindunuwewa killings and several other crimes. Tamil people are also perplexed by International community's silence on these crimes," he added. The event was presided by NESOHR chairperson Fr M X Karunaratnam. Academics and Human rights activists from Northeast and South including Vice Chancellor of University of Jaffna Professor S Mohanadas, Mr S Sivapalan from Trincomalee, and Government Agents took part in the meeting. Mr. Jehan Perera, Director of the National Peace Council in Colombo, also participated in the panel discussion on the right to self determination.